A definite all time comfort food. It is easy to whip up using either left over roast chicken or fresh chicken. 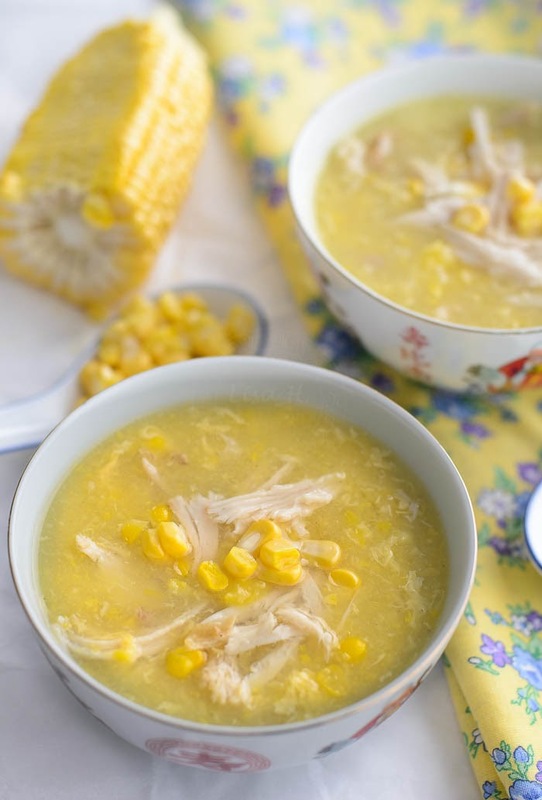 This bowl of Chicken and Sweetcorn Soup is pure comfort food and its delicious. 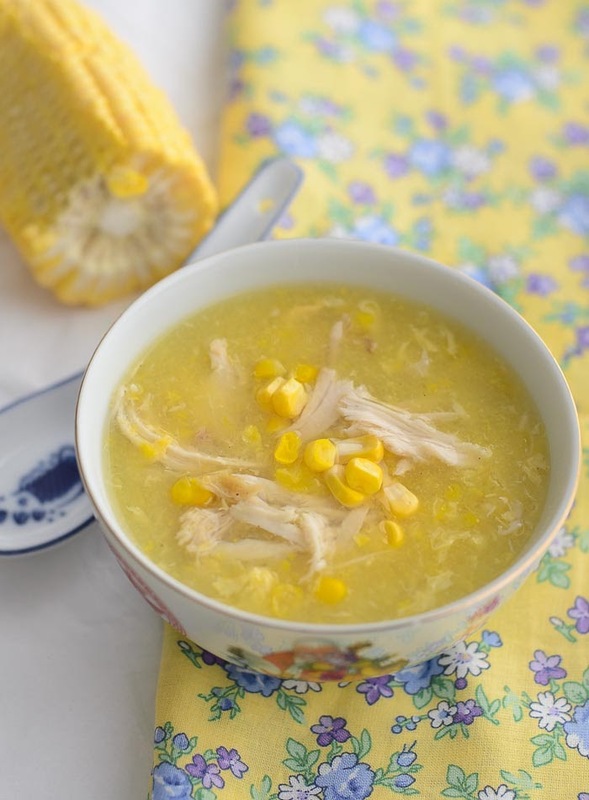 Chicken and Sweetcorn Soup is quick and easy to cook . 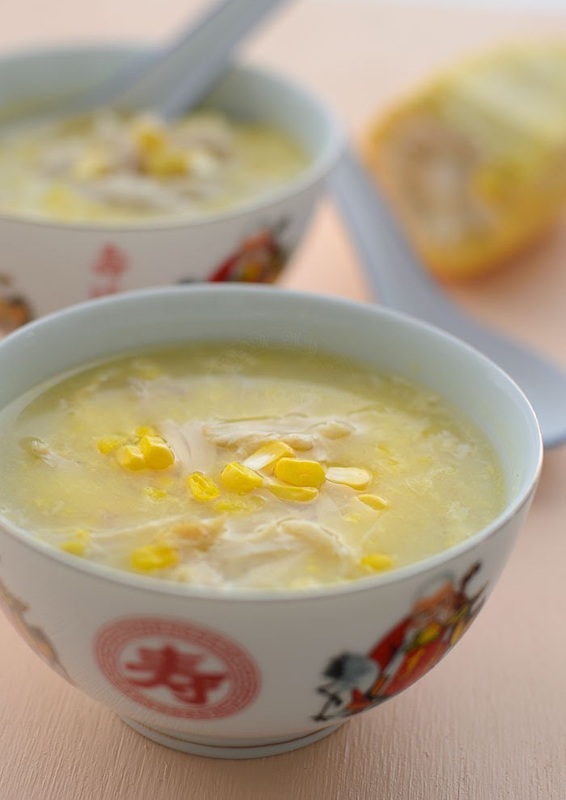 Have you tried the Chinese takeaway version of chicken and sweetcorn soup? When I first started out, I set myself a 'Target' of 3 posts per week; Monday, Wednesday and Saturday. And it has to be one of each; Western , Asian and Dessert respectively. I was cooking and cooking and cooking then big chunk of time was trying to photograph the dish. I had more than 100 posts waiting in the 'Draft' folder at one time. My hobby, my passion has become my obsession! I eat Blog, sleep Blog and everything Blog. Hubby often said 'It doesn't matter if you are not able to post on time' ! I turned a deaf ear! when I discovered webpages that display foodies' photos, I was again excited and joined in the bandwagon and submitted mine. I was overjoyed whenever my submissions were accepted and I get very upset, if its otherwise. I had time re-assess, re-evaluate (late last year). Life is too short to dwell on negative issues. YES! I will still carry on BLOGging. I am still having fun. Sometimes I just have to STOP! Look BACK, something wonderful and beautiful is just waiting to be discovered. Life is too short, hence need not be complicated as making this delicious bowl of Chicken and Sweetcorn Soup. This my family favourite soup, our comfort food, especially during cold wintry days. Chicken and Sweetcorn Soup is so easy to make. From stove to table within 15 minutes. It can be prepared using either left over roast chicken or fresh chicken, and use either fresh corns or canned creamed corn. My family preference is to have leftover shredded roast chicken in the soup. 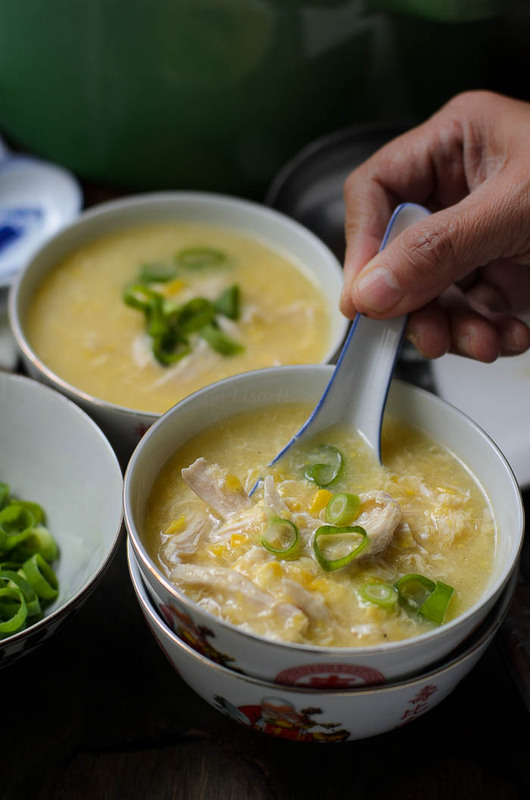 A pot of comforting Chicken and Sweetcorn Soup can be served with steam rice. Smooth and silky Chicken and Sweetcorn Soup A definite all time comfort food. It is easy to whip up using either left over roast chicken or fresh chicken. Bring water to boil in a stockpot. Take out the chicken and transfer the chicken pieces to a bowl of cold water and shred chicken. Add corn flour to water. Mix well. Pour into the stockpot and stir until soup thicken. Lower the heat to a simmer for 5 minutes or until the egg is cooked. Season with salt and white pepper (black pepper). Turn off the heat and add a dash of sesame oil. This soup reminds me of summer -- beautiful styling and colors!! That is EXACTLY how I felt when I first started too. Constantly checkign stats, emails and seeing how many people had commented. Now I am much more relaxed and it helps that I have 2 children who keep me busy! Wonderful soup and congrats on 4 years!! Congrats on the 4 years and to many more! So you start your day before 5:30 : )? Ever heard that many successful people have one thing in common - short sleeps and working early? Anyway, enjoy your rhythm in blogging! Amazing photos and delicious soup! This is just what I need to get me over the mid-February slump! Great photos. I used to think blog 24/7.. but not anymore.. it's not an obligation..i decided to become a full time mom and a part time blogger.. I used to be quite obsessed with blogging when I just started. I recall working on some simple basic coding till 2am! Now I have taken it easy and really, I enjoy it more when I take it easy. First of all, congratulations on your 4th year of blogging! WOW! You are amazing. I don't think I know many bloggers who have that long history and you are definitely my senior blogger friend. That's why I appreciate your story even more. I actually encountered several posts like yours, senior bloggers talking about life and blogging when I was going through almost 1st year anniversary. It helped me a lot. I didn't have to guess or imagine what it's like. Someone already experienced and talked about it. I was lucky enough to slow down from my second year a bit, so that I can have a balanced life and learned the importance of off-line time. Like Tigerfish, I spent my late nights on blogging (just like her, 2am! ), but I'm in a better place now. Maybe not perfect, but at least some balance. So, thank you for sharing your thoughts. My son has been asking corn soup for almost a month. 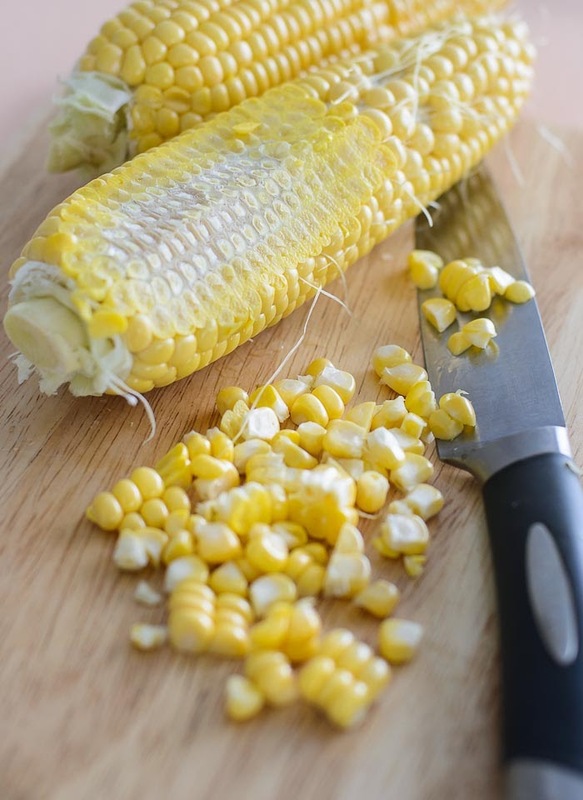 I was going to make Western corn soup, but I changed my mind. This is similar to what I make, but I never added roasted chicken. It will only deepen the flavor. Nice idea! I guess we are all consumed by the blogging bug especially in the early days. I am still learning to let go and I have missed my schedules. Not as hung up anymore when pictures get rejected by FG or TS. Gotta move on. The corn soup looks good! Love that it is so simple to make. This looks sooo good! How many servings would you say this is? One of my favourite soup ever! I think the more we think the more we stress out and it takes the joy out of blogging. Relax and enjoy and do not worry about anything at all. It has become a stress buster for me (tho' the photography part still stresses me out- but it makes me learn). I LOVE this soup, simply love it. The Indo - Chinese cuisine has a very similar soup, almost exact and it is my very favorite.have to make this soon. 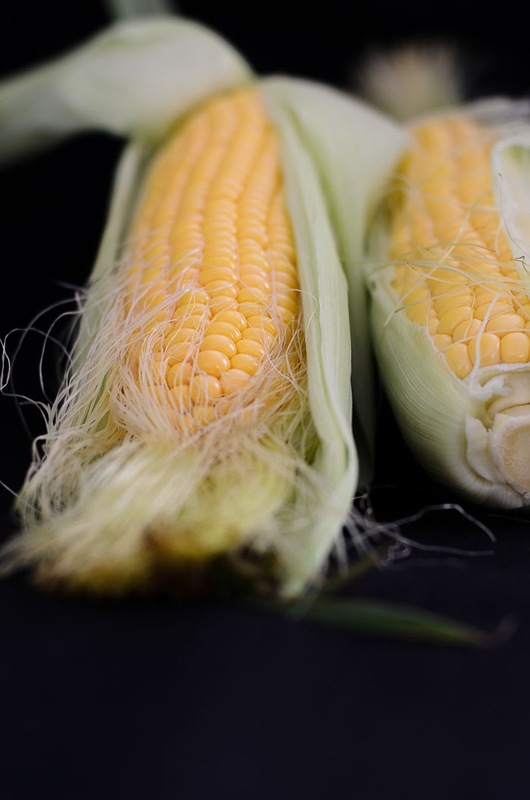 Thank you for posting this chicken and sweet corn recipe. This could be a great treat for any meal. I love this soup. We love having it with a splash of green chili infused vinegar, so yum! You are doing something amazing on your blog :-) Never stop! Congrats on making it into the 4th year,Lisa ! I was like you in the beginning but still my pace is low,about 4 posts per month,both kids occupying most of my time.It has become even slower now,this I'm saying after just 7 month of blogging.I'll keep on blogging as it's my hobby and passion but will not let it complicate my life. Sweet corn chicken soup is my family's favorite. This soup looks delicious although I'm not sure why my family never quite had this soup when I was younger. I remember those bowls when growing up. They are big, sturdy and thick unlike the newer ones today. I can't help & smile when I read about your blogging experience.. everything you wrote is just like what I'm doing now.. cook cook cook, click click click. My blog is just a few months old, and I eat, sleep, breath even dream blogging! It's amazing how it consumes us food bloggers! I've never experienced anything like this with other parts of my life.. does that mean it's my ultimate passion? hope to find my answer soon! Hi....I'm new to cooking soups - I am not familiar with Maggi cubes - can I substitute chicken bullion cubes instead? If i can, are there other ingredients I can add to compensate for some lacking flavor in the difference? Anyway, could you tell me the process you do when you pour the eggs in? Thank you..